With the race against the clock that most people live daily, it is not at all surprising that the slow cooker is gaining popularity. Everyone wins when it comes to saving time. Imagine just stirring together the required cooking ingredients, attending to other chores while the slow cooker does its job, and spooning out a perfect meal at the end of a number of prescribed hours. This is possible because the slow cooker allows you to prepare dishes safely even in your absence. In addition, because the food is simmered for several hours, the taste of both meats and vegetables ends up being considerably enhanced when compared to other cooking methods. You will find below the main points to consider before deciding which slow cooker to buy, and a comparison of the most popular slow cookers that satisfy these points. First, you need to choose a slow cooker that is big enough. Even if you are single, you will appreciate having enough room to cook a whole chicken or a large roast, and keep the leftovers in the freezer for later so that you may have additional meals. A slow cooker with a capacity of less than six quarts (about six liters) will leave you on your hunger, and we do not recommend it. Cleaning is a major factor that often condemns your slow cooker to being left unused in your kitchen cabinets. If laziness affects your cooking habits, you should definitely choose a model with a removable pot that can go in the dishwasher. Are you not really technically oriented? Beware then of slow cookers with a large number of control buttons that complicate your life, but that are not really necessary. Ideally, you simply need some programming function allowing you to set the cooking temperature and time according to your recipes. You should also be looking for a model with automatic switching to "warm" setting at the end of the timed cooking so that the food does not overcook and stays warm until you are ready to serve. The best slow cookers come with a glass lid which allows the observation of the meal while it is being cooked as well as the evacuation of droplets of steam. It is also important to choose a slow cooker with a ceramic or stoneware pot that is pretty enough to serve as a serving dish and that is dishwasher washable. Note that we prefer stoneware to ceramic as the former is oven safe and impervious to water while the latter is not. So, if you want to rewarm your meal later in the oven a stoneware pot will allow to do that. Finally make sure your slow cooker has full-grip handles for safe transport around the kitchen. 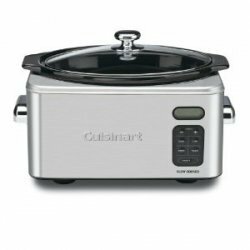 To help you decide which slow cooker to buy, we will compare the Hamilton Beach 33969, Cuisinart PSC-650 and Crock Pot SCVT650-PS slow cookers which provide all the above mentioned features, and which are at the same time among the most popular among Amazon buyers. Hamilton Beach 33969 has 3 cooking modes which are: Program, Manual, and Probe (see below for more details). Cuisinart PSC-650 has 3 automatic-cooking options which are: Simmer, Low, and High. 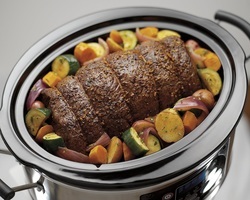 Crock-Pot SCVT650-PS has 3 automatic-cooking options which are: Low, High, and Warm. All three slow cookers allow programmed cooking, for details please see the detailed description section below for each cooker. The probe cooking found on the Hamilton Beach slow cooker should be used when cooking a large cut of meat or using a recipe that requires food to reach a certain temperature. The included thermometer probe is inserted into the meat, and it monitors the cooking process until the meat reaches the desired temperature. It then switches the slow cooker automatically to a low setting to keep the meat warm until you are ready to eat. You will find below detailed descriptions for each of the three slow cookers. 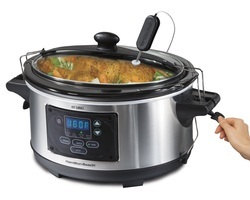 This slow cooker measures 16x10.4x16.1 inches, weighs 14.6 pounds, and it comes with a 6 quart removable oval-shaped stoneware pot as well as an LED digital control panel. The panel offers three cooking mode options (program, manual, or probe) and the very convenient automatic keep-warm feature that the unit automatically shifts over to once the cooking time has ended. The manual mode allows for cooking the traditional way without setting the time or for heating up previously cooked food. The probe mode should be used when cooking a large cut of meat or using a recipe that requires food to reach a certain temperature. The included thermometer probe is inserted into the meat, and it monitors the cooking process until the meat reaches the desired temperature. It then switches the slow cooker automatically to a low setting to keep the meat warm until you are ready to eat. This very useful feature takes the guesswork out of slow cooking. This slow cooker also provides attractive stainless-steel housing, power-interrupt protection, a clip-on spoon, a clip-tight gasket lid, and full-grip handles for safe transport. The removable stoneware and tempered-glass lid can be cleaned up easily by hand or in the dishwasher, and a user manual with recipes is also included. The unit comes with a one-year limited warranty. As can be seen, this unit not only satisfies all the requirements for a good slow cooker listed in the previous section, but it also offers the manual and probe modes of cooking that can be very useful. This slow cooker measures 18.8x15.7x10.9 inches, weighs 20.3 pounds, and it comes with a 6.5 quart removable oval-shaped ceramic cooking pot. It is equipped with three modes (simmer, low, and high). It is 24-hour programmable and has a digital countdown timer with touch-pad controls, and it has the automatic keep-warm feature that the unit automatically shifts over to once the cooking time has ended. It has a brushed stainless-steel housing, a glass lid with stainless-steel rim, and cool-touch chrome-plated handles. Other features include nonslip rubber feet, retractable cord storage, wrap-around heating elements for thorough heat distribution, and dishwasher-safe parts (lid and ceramic pot). Accessories include a cooking rack for use with ramekins or other bake-ware, a recipe book with 70 easy to do basic to gourmet dishes, and an instruction book. It comes with a 3-Year limited warranty. As can be seen, when you compare slow cookers, this unit satisfies all the requirements for a good slow cooker listed in the "Features to Look for" section above. It also comes in the smaller 4 quarts size. This slow cooker measures 16.5x8.6x12.2 inches and weighs 14.6 pounds. It comes with a 6.5 quart removable oval-shaped stoneware pot and a touchscreen LED digital control panel that allows programmable cooking. Fingertip touch controls include Low, High, and Warm cook settings, as well as Time Up or Time Down options for setting the cooking time from 30 minutes to up to 20 hours. The digital timer counts down the remaining cooking time, and the unit automatically shifts over to a keep-warm mode at the end of the cooking time. The digital timer also keeps track of time spent in keep-warm mode, counting up in one-minute increments for up to six hours. The attractively designed removable stoneware crock can be used as a serving dish. Other features include a polished stainless-steel exterior, metal side handles with stay-cool wraps, and a large round lid handle. The stoneware and glass lid are dishwasher-safe, making clean up a breeze. The slow cooker comes with a cookbook and a one-year limited warranty. As can be seen, when you compare slow cookers, this unit also satisfies all the requirements for a good slow cooker listed in the "Features to Look for" section above. So which Slow-Cooker to buy? When you compare slow cookers, you find that all three brands described above are great products, and Amazon customer reviews are mostly full of praise for all three. However, given that the Hamilton Beach is quite a bit lower priced than the other two brands, we recommend it strongly, and in particular for the probe mode not offered by the other two brands. 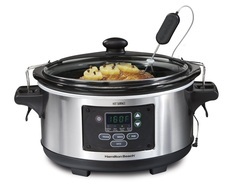 With the Hamilton Beach slow cooker you will find it very useful to simply insert the thermometer probe into the meat to have it monitor the cooking process until the meat reaches the desired temperature. It will then switch the slow cooker to a low setting to keep the meat warm until you are ready to eat. There's absolutely no guessing how long it will take to cook. Another great feature of this slow cooker is the clip-tight gasket lid. It's perfect for traveling to pot-luck dinners without to have to worry about spills. Please click below the selected slow cooker to check the price. Would you be interested in a Wi-Fi enabled remotely controllable slow cooker? Now you don't have to be in the kitchen anymore to change dinnertime! The Crock-Pot Smart Slow Cooker is WeMo enabled and works with your smart device to conveniently adjust cooking settings. You can adjust cooking time and temperature, shift to warm or turn the cooker off, all from your smart device using the Free WeMo App. The free WeMo App is available for Apple (iOS 7 and higher) and Android (4.0 and higher) devices. You can connect from anywhere with Wi-Fi/3G/4G. The slow cooker has 6-quart capacity, cool-touch handles and built-in cord storage. It comes with a removable dishwasher-safe stoneware inner pot and and a glass lid. The complete slow cooking book.